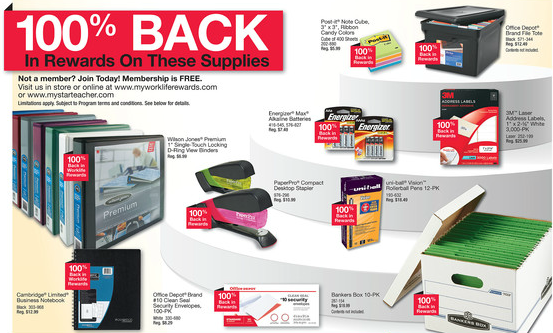 Office Depot gives you 100% back in Worklife Rewards. Read my post "How does Office Depot's Worklife Rewards Work?" for more information on this amazing program. Use your Rewards Certificate for this offer. I have a Certificate for about $63, which I'll be using to purchase some of these items. Additionally, to get the most bang for your buck, don't forget to go through the Ultimate Rewards Mall for 4x UR points or an online shopping portal. Below, you will find offers available now through April 21, 2012. You may purchase 2 of each item, per member, per day. Some items are for in-store only. If you do decide to purchase them in-store don't forget to bring your Worklife Rewards Number with you. 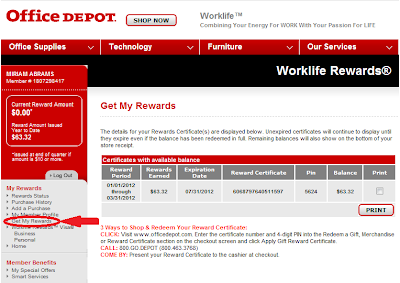 clicking on Get My Rewards, you can view how much is available for rewards and the certificate number. You can either print the certificate out and use it in-store, phone in your order and give them the certificate number or simply use it online by entering the Reward Certificate and PIN number (seen below in the picture).